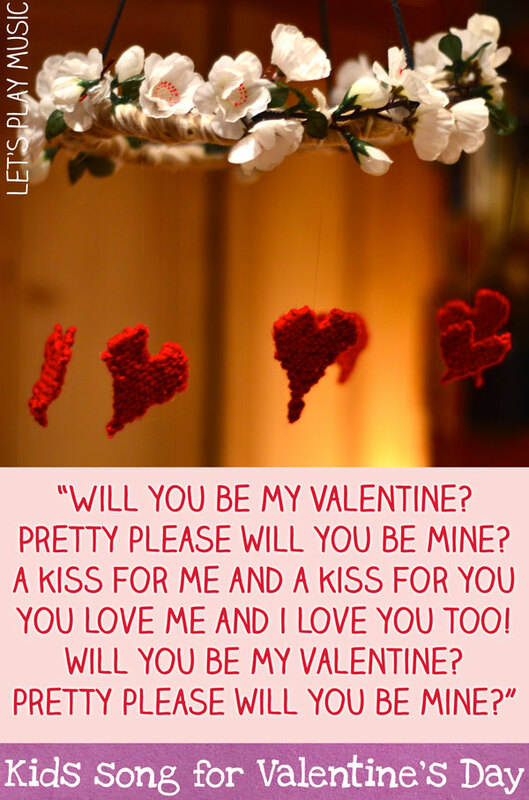 This Valentine’s Day Song for kids is perfect for celebrating love and friendship. It’s lovely to encourage open expression of affection for our nearest and dearest, and little ones will enjoy singing this simple Valentine’s Day song because it is sung to the same tune as Twinkle Twinkle Little Star! Pretty please, will you be mine? A kiss for me and a kiss for you! Pretty please will you be mine? What you need: Some wire or wicker cane, raffia or wool, string, fake flowers or ribbons to decorate, some card or fabric to make the hearts, some nylon thread to secure them, scissors. 1. First you make the base of the ring. You can do this in a number of ways depending on what you have to hand. Wire works well, wound round on itself a couple of times if necessary. I used wicker cane that I happened to have left from a previous project. 2. Once you have the ring, you need to pad it out to make it thicker. Raffia is ideal, but as I didn’t have any, I used cream and beige wool. You need to make it about 10cm in diameter. 4. Secure 3 strings to the ring for hanging, equally spaced apart and tied together at the top like a wigwam. A ring from a keyring can be used to hang the garland. 5. You can make the hearts out of card, felt, have some fun with sticking and glueing, or if you can knit (see the pattern at the bottom of the page) they don’t take long and look lovely! 6. Secure the hearts to hang from the ring with fine nylon thread, so they appear to float! For a fun circle game for preschoolers, check out our musical Valentine’s Day Circle Game! These hearts were made with red 4ply wool and size 3mm needles. 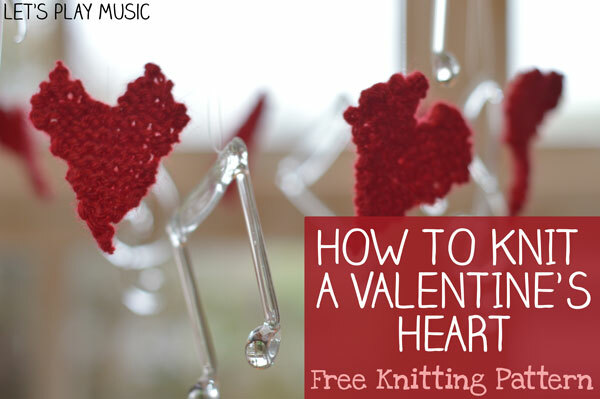 If you use thicker wool or larger needles you will end up with thicker, chunkier hearts. They can be used to make cards lovely string garlands and look great on the Christmas tree! – Knit one row, and then increase 1 st on either side again as before, then knit the next row. Continue increasing on alternate rows in this way until you have 12sts. – Work on these 5 sts, decreasing on either end until you have one stitch left, cut the yarn and thread it through the last stitch, pulling it tight and sew it neatly into the knitted edge. – Now work on the 6 sts of the other side of the heart in the same way. – Finish off by sewing any loose ends into the knitting to neaten and secure. 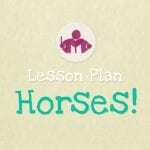 Check out our Valentine’s Day Lesson Plan for 30 minutes of fun musical activities with a love and friendship theme. If you enjoyed this post, come and join us on Facebook & Pinterest and subscribe to our newsletter for many more musical ideas! 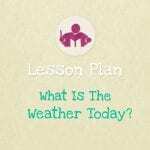 Thanks for linking up to Showing kids love, pinned ! Thanks you for pinning and hosting too! Thank you – and thanks for pinning too! I love the garland – it’s so beautiful! Thanks for linking to The Sunday Showcase.I’ve pinne dot our board. So pretty!! I love the song too. My daughter was making ones up yesterday for the holiday. Thank you for sharing at Sharing Saturday!! Thanks – that sounds lovely. Making little songs up is so much fun! Fantastic valentine’s crafts! I’m having a love heart theme for my daughter’s first birthday and was already planning on knitting some hearts- never thought to make them into a garland! Thanks so much for sharing! Glad you like our Heart garland, heart decorations look great at Christmas too!